In summer 1990, Saddam Hussein’s military forces invaded Iraq’s southern neighbor, the tiny country of Kuwait. 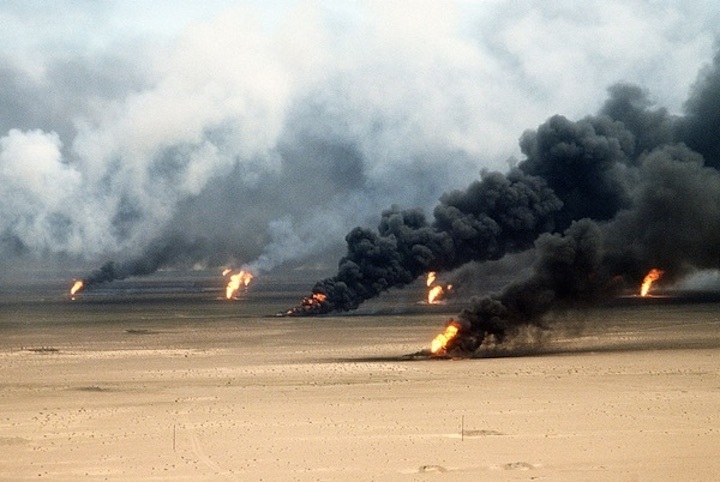 The United States mobilized for war and in early 1991 launched a massive air attack against Iraqi forces, later followed by an invasion of both Kuwait and Iraq. 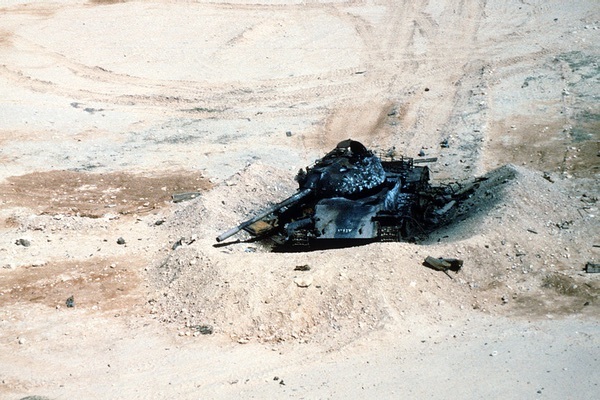 Generally referred to as the Persian Gulf War, the two primary phases of the operation were designated Operations Desert Shield and Desert Storm. In relatively short time, the Iraqi military was defeated. “Wide area synoptic coverage could have captured the whole Iraqi land mass and forces in one fell swoop and had the film and some exploitation to them in two days,” a former NRO official explained. There is a need for wide-area synoptic coverage. The area occupied by Iraqi forces was on the order of 27,000 to 30,000 square miles, the size of four New England states. In hindsight, getting rid of both the SR-71 (high-altitude photographic reconnaissance aircraft) and [a wide-area satellite imagery system] at the same time was short-sighted. The Commander-in-Chief [CINC] lacked synoptic coverage. The SR-71 was retired in spring 1990, only a few months before the Iraqi invasion of Kuwait. The last successful HEXAGON mission was in 1984, followed by the last launch in 1986. The unnamed military commander quoted in the HASC report was clearly bemoaning the loss of the incredibly powerful HEXAGON system, and unhappy with its replacement. A former NRO official agreed with the commander’s assessment. “Wide area synoptic coverage could have captured the whole Iraqi land mass and forces in one fell swoop and had the film and some exploitation to them in two days,” he explained. He also thought that the soda straw analogy was misleading, because it missed the fact that the individual images stitched together to produce a mosaic of a larger area were taken at different times, and things could change in the interim. “How many times would you count the same taxi (tank) that had moved from place to place and been imaged multiple times at multiple places?” he asked. There really was no substitute for the kind of coverage that HEXAGON had provided, photographing vast amounts of territory very rapidly, seeing entire armies in a single pass overhead. In his 1996 interview, NRO director Martin Faga had much to say about the NRO’s support to Operations Desert Shield and Desert Storm. Faga stated that he felt that much of the criticism of satellite capabilities during Desert Storm was unfair. “Over the period of the war, from the invasion in August through the end of the conflict in February, the number of satellites available to watch the area was the same, but the product almost doubled,” he said. Faga attributed this to NRO assistance in targeting and effective resource management. Although Faga did not directly address the issue of broad area coverage raised by the military commander, he attributed most of the complaints about lack of imagery to a ground distribution problem, not a supply problem. The United States Army, Faga stated, had spent a significant amount of money on ground systems for processing satellite imagery and enabling its distribution to field commanders. In contrast, the Air Force had spent very little money on that capability. As the military build-up in theater occurred, General Norman Schwartzkopf, who commanded all allied forces, partially rectified the situation by sharing the Army’s capability with the Air Force, spreading the assets thin and leading to much grumbling. The problem was not the satellites, Faga argued, and he noted that afterwards the Air Force began investing significantly in ground processing and distribution equipment. Although the distribution of intelligence information in the field had resulted in much criticism, notably, the quote in the House Armed Services Committee report identified collection systems—specifically the lack of both the HEXAGON and the SR-71—as a major problem. How the collection systems fit into the overall intelligence collection mission during the late Cold War was an even more complicated story. Several former senior CIA analysts were asked about their opinions concerning the end of the HEXAGON era and the deficiencies of the KENNEN for the search mission. “It was true,” one former analyst confirmed, the HEXAGON had been superior to the system that replaced it even though the HEXAGON used film and returned its images days—sometimes weeks—after they had been taken. Imagery provided proof of what existed, but not what could existin the next few years. And sometimes the imagery provided data that could be accurate but misleading. Another analyst who was also familiar with the NRO disputed that assessment: “Virtually all relevant shortfalls in area coverage between the two could be managed with effective collection tasking management, which was problematic, given competing priorities.” But a former NRO official who was intimately familiar with the HEXAGON’s capabilities thought that the problem of competing imagery collection priorities was not an excuse, it was the whole point: without a dedicated satellite like HEXAGON providing search imagery, of course the search mission would be neglected for other missions that were considered higher priority by the intelligence community, and it was. But the former analysts also added that imagery collection and its shortfalls was only part of a much bigger puzzle that they were trying to assemble. Imagery alone could not answer all of the questions that intelligence analysts were trying to answer. Imagery provided proof of what existed, but not what could exist in the next few years. And sometimes the imagery provided data that could be accurate but misleading. For instance, during the 1970s and ’80s CIA analysts had to try and project Soviet tank production in coming years while also calculating what tanks were already deployed and ready to face down NATO in Europe. This created several complicated dilemmas, because analysts realized that the Soviets should have been producing far more tanks than the satellites were showing deployed in the Soviet Union and the various Warsaw Pact nations. The satellites had also photographed Soviet tank production factories, which were huge and should have been capable of turning out many tanks per year. Were the satellites not photographing all the extra tanks in the field—perhaps because the Soviets were very effectively hiding them—or was Soviet production much lower than the CIA’s analytical tools indicated? Although it has been gone for decades, the HEXAGON’s capabilities have never been replicated. It turned out that Soviet tank production was much lower than initially calculated. While the Soviets had vast factories dedicated to armored vehicle production, they were incredibly inefficient and produced far fewer tanks than American industry did based upon floor space and workforce. It was not just the size of a factory or the number of tanks in the field revealed by the satellite images, it was the analytical models used to interpret all that data that were required to produce more accurate intelligence that could be delivered to decision makers. Later, while trying to verify the Treaty on Conventional Armed Forces in Europe in the early 1990s, American inspectors got into heated arguments with Russian field commanders who they thought were showing them obsolete vehicles rather what was officially in the Russian reporting and was supposedly in the inventory. The inspectors always heard the same response: “We are showing you what we have, not what we report to Moscow.” The Soviet system was not only one big puzzle to the Americans, it was a puzzle to the Soviets themselves. Although the satellites could not answer all the questions, these incidents also emphasized the value of satellites over spies. Even if a spy got top secret information from inside the Soviet army, it might be nothing but a collection of lies that everybody told to everybody else, all in support of the biggest lie of all: that communism was working. In his 1996 interview, former Director of the NRO Martin Faga made another novel argument that the intelligence community now takes for granted: satellites could not do everything. What the military needed was drones that could go into areas where the United States did not necessarily have total control of the skies and then operate there for a long period of time. By the early 2000s, the era of “persistent surveillance” by unmanned drones like the Air Force’s Predator became common. But whereas satellites cannot hover over a single location for a long time, aircraft cannot go over what the intelligence community still refers to as “denied territory.” To do the intelligence mission, you need both, and even then there will be many unknowns. Today, 25 years after that history was written, and over three decades since the last successful HEXAGON mission, HEXAGON’s unique collection capability has almost surely still not been matched. 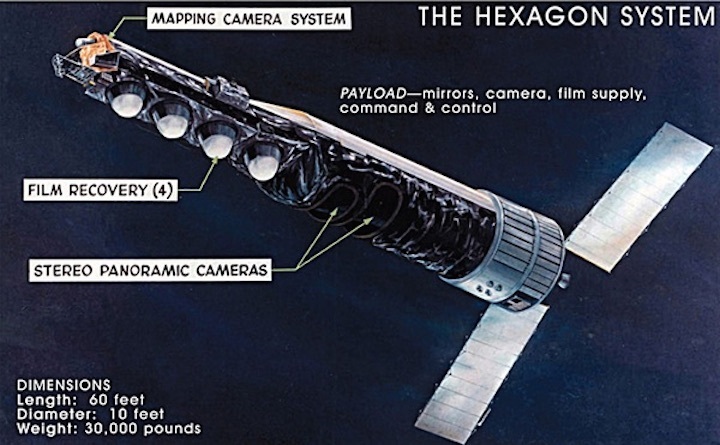 Even today, the story of the HEXAGON—and the space shuttle—is still being written, but one thing is increasingly clear: HEXAGON was unique, incredibly powerful, and missed by the intelligence community and the military.